Since starting my blog I have become more and more conscious about skin care and what I'm putting on my face. Which has been a god send for my skin, not so much for my purse as it seems I have expensive taste as you'll see from my wishlist! Most of these products are a wish either from bloggers reviews (mainly Anna) or from using other products from the brand, or by using samples. I got a sample of the Oil Free Lotion when I recently purchased from Origins and I've just fallen in love with it. My skin has never felt more moisturised and it helps to balance out my complexion. I'd love to use the rest of the range to try out to see if they were as good as the Liz Earle cleanse/toner collection and which combinations go well together. I am however definitely buying the lotion once I've next been paid. This is an 'Anna's' fault product. After watching her recent skin care video I fell in love with the idea of product. The fact that it's an overnight to resurface and firm you skin and is recommended as an anti-acne product, it sounds perfect to me. I went straight to the nearest website to purchase it until I saw the price. This is a spanner in the works for me, I'm so dubious to buy any skin care for over £25 in case it doesn't work. But I'm still dreaming about this product. I've been using a sample of this in Ivory for the past two weeks and am totally sold on this product. It lasts, gives great coverage and doesn't make my skin break out in oily patches or acne. This will be another pay day treat for me as I haven't found another foundation that matches my skin tone as well and does exactly what I want from a foundation. It was love at first contact! Now this is another recommendation from Anna however I'm dubious to purchase as it's had mixed reviews across the blogosphere. It's meant to smooth away lines, tighten pores and refresh your skin, as well as helping to set your make up. All with a spritz! Would love to try it but for the price it's a pretty pricey mistake to make if it doesn't work for me. 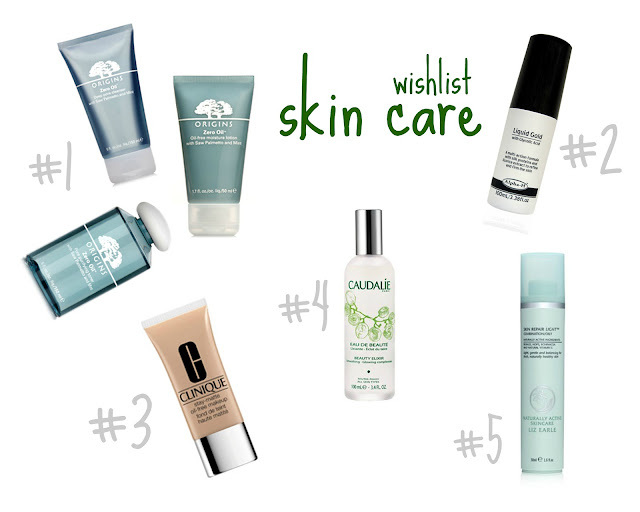 Couldn't have a skin care wish list without Liz Earle! Even since I tried Cleanse & Polish and the Toner, I can't live without them and this is the recommended moisturiser to go with. I've been using the Origins sample as stated above but I'd quite like the full set - as with the Origins one! Bit greedy me opps! I would love to know if you'd tried any of these products and what you made of them - see if you can convince me to sway either way of purchase - to buy or not to buy! The moneys fate is in your capable hands!